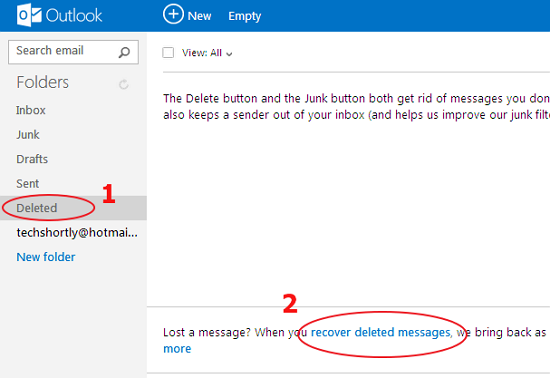 With Outlook.com if you deleted any important email from your inbox can recover from Deleted folder. But if you removed from Deleted folder too (or) hackers deleted all your important messages from your account. No problem, outlook.com allows you to can easily recover all deleted emails from your account even deleted from your deleted folder. In the left pane of the Outlook window, click the Deleted folder then scroll outlook window and click the recover deleted messages link in bottom of page. 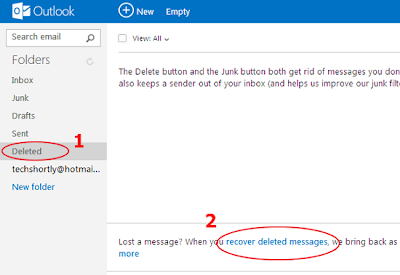 After click the recover deleted messages link Outlook starts to recover deleted messages as many messages as possible and bring back in to your Deleted folder. And it shows the count of your recovered messages bottom of deleted folder. When you recovered your messages can move it from Deleted folder to your inbox. If you don't see the deleted messages again that you wanted, it means they are permanently lost you cannot recover that messages. Make use of pst repair tool scans, identifies, recovers and saves such Microsoft Outlook items as messages, contacts, notes, reminders, journals, meetings, etc.